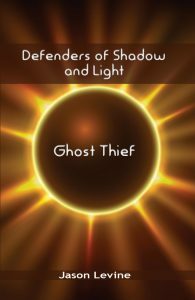 Each tall tale includes 5 mini-games which are integrated into the story. 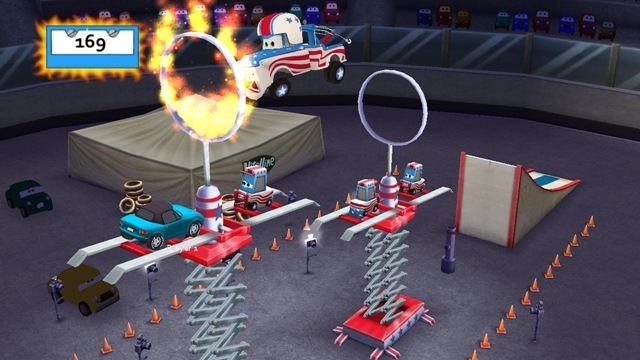 Games range from firing hubcaps at floating tires, to putting out fires, to racing up a tower in Tokyo, to dodging bulldozers. Before each mini-game, a quick tutorial on how to play it appears. The games fit in perfectly with the story and really make you feel like Mater’s included you in his tale. With just this, Mater’s Tall Tales would be a pretty good game, but they upped the ante. Depending on how well you do, you can earn a bronze, silver or gold trophy. Earning a trophy, unlocks the game in Free Play and Playlist mode. 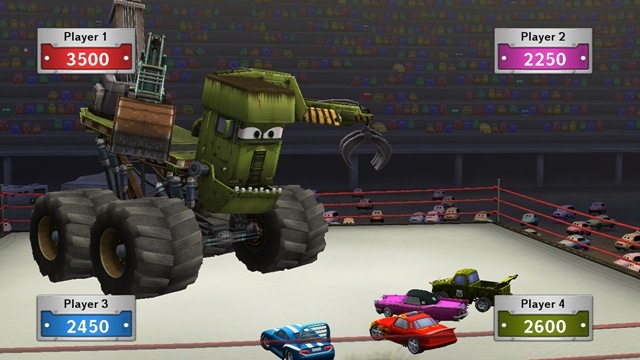 Free Play mode lets you choose a single mini-game to play while Playlist lets you choose a series of games from across all of Mater’s Tall Tales. In addition, you earn money for completing games. The better you do, the more money you earn. Money can be used in your garage to buy cool add-ons for your car like spinning hubcaps a new paint job or a rear spoiler. There are enough free items that you start with to nicely customize your car avatar, but you’ll quickly find yourself trying to earn a little more to buy that cool accessory or paint job. Another cool feature are the collectibles. Each game, besides having a goal, has a second goal that adds a collectable to the board in your garage. These vary from doing very poorly (don’t get the flag in a bulldozer fighting game) to doing very well (don’t get hit at all by ninja car throwing stars) to the somewhat odd (knock over 5 cacti while fleeing from government cars after Mator’s UFO friend). By and large, they aren’t hard to get, but they spur you on to play the games more and more. As you earn more trophies and unlock more items, you can also unlock more cool license plates for your car. While these don’t have any in-game use that I can tell, they are a nice touch. NHL and I both loved playing this game. 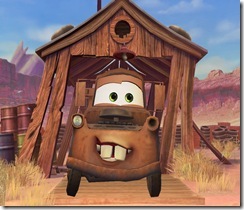 Not a day has passed without at least one request from NHL to play Mater’s Tall Tales. (An NHL video review will be coming soon.) JSL even joined in on the fun. Although he was a bit too young to play it properly (and too independent to allow me to help him), he still had a blast. 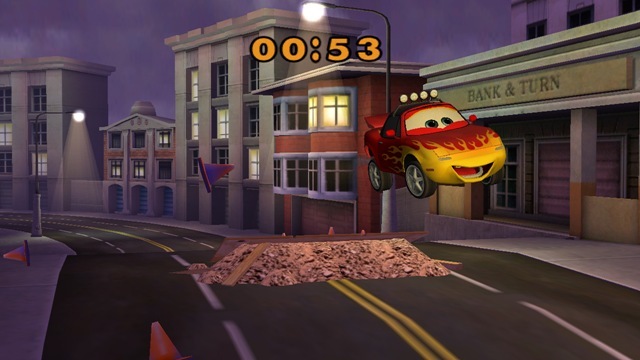 I would definitely recommend this game for anyone, but especially for anybody who is a fan of the Disney/Pixar movie Cars. 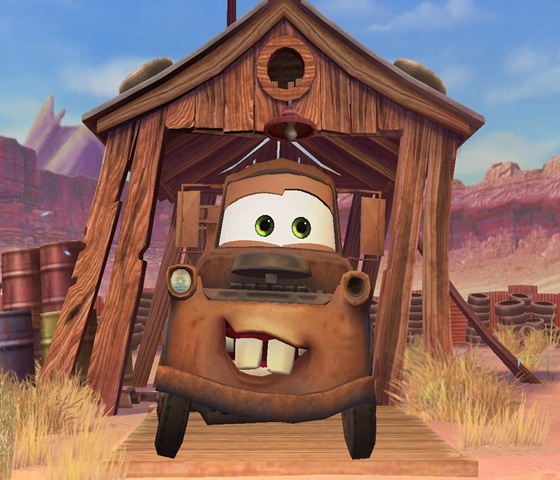 Anything you’d like to add, Mater? 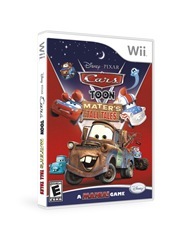 Disclaimer: I wrote this review while participating in a blog tour campaign by Mom Central Consulting on behalf of Disney Interactive Studios and received the Cars Toon: Mater’s Tall Tales Wii game to facilitate my review. All of the opinions expressed above are my own.